Originally built in 1970, this large five-star hotel on Portman Square has a traditional style and ambience, 434 luxury rooms and suites, and renowned restaurant Locanda Locatelli. A large five-star hotel with tranquil views over the picturesque Portman Square. Originally built in 1970, this large five-star hotel, one of over 140 Hyatt Regency hotels around the world, has a traditional style and ambience associated with older properties. Framed artworks, high ceilings, large windows, fireplaces, chandeliers, wood-panelling and marble floors typify the public areas, while the 434 bedrooms and suites are light, airy and modern. Renowned restaurant Locanda Locatelli offers on-site Michelin starred dining while the Montagu restaurant and Churchill Bar and Terrace offer tranquil views over the picturesque Portman Square garden while bustling Oxford Street is just behind the hotel. This superb Michelin starred restaurant opened in 2002, the first solo venture of Giorgio Locatelli. This superb restaurant within The Churchill opened in 2002 as the first solo venture of Giorgio Locatelli (formerly Head Chef at Zafferano) and has since won praise from virtually every visitor and the Michelin men who first awarded it a star in 2003. The decor is reminiscent of the more stylish side of the New Romantic era, all tasteful drapes and elegant retro fittings, and the service is bright and friendly. The menu includes Italian classics and a few innovative twists, but the strength of this menu comes from the total commitment to ingredients. All the food is sourced from Italy and all pastas, marinades and the likes are freshly made on the premises. Such attention to detail gives the ideal foundation for classic Italian cooking. Every menu item here is cooked in a simple but loving style, and the well-balanced dishes allow the flavours to shine through. Competing for the title of "best Italian kitchen in London", you'll have to book early but it's well worth it for a meal that will stay with you for years to come. First class. A stylish restaurant offering a taste of upmarket dining. 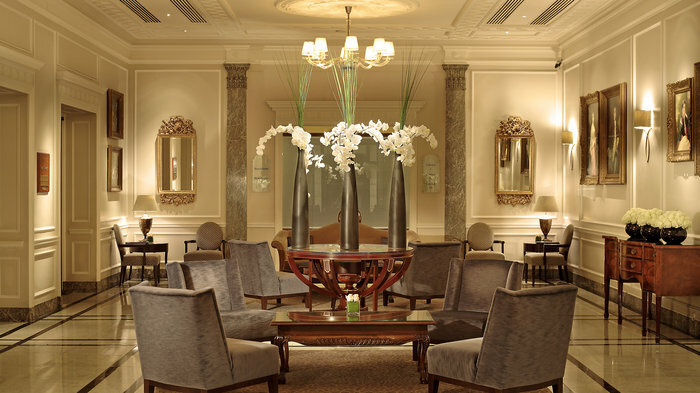 Attached to the opulent Hyatt Regency London The Churchill hotel The Montagu is a truly stylish restaurant - offering a taste of upmarket dining. The top notch ingredients and diligent preparation one expects from high-end kitchens make this a fine dining experience accompanied by an extensive and fairly priced wine list. Highlights include the oak-smoked salmon - exceptionally good - and steak, perfectly cooked and very succulent, garnished with port wine shallots. Desserts include a delicious sticky toffee and date pudding with toffee sauce and vanilla ice-cream. Retire for a coffee in front of the fire for a relaxed ending to a truly special occasion. A great bet for a romantic night out, The Montagu combines good food with a great location - at a realistic price. From cheap budget hotels to luxury 5 star hotels see our deals for hotels, including Holiday Inn London Kensington Forum from 38% off.